Zayell Johnston was tired of putting off something he’d wanted to do since he was 20 years old. 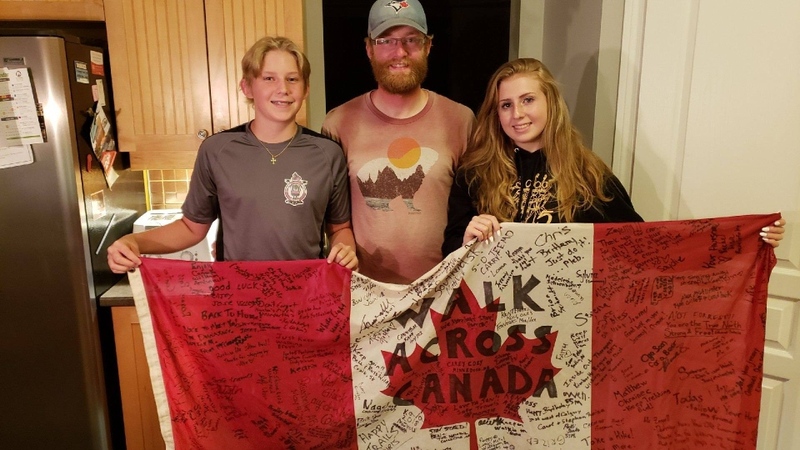 So for nine months last year, the Saskatchewan resident took a 9,000-kilometre walk across Canada and ended up taking over 11.8 million steps. During his walk, Johnston said he waded through mud, trudged through snow and even bumped into bears in the wilderness. The 27-year-old man from Yorkton, Sask. documented nearly everything on social media to help show off the country. And Canadians didn’t disappoint: He regularly had strangers offering up food, places to sleep or areas he could set up his tent. “An elderly couple in Calgary was the first experience of offering a place to stay -- lucky coincidence, because it was my birthday back in April,” he laughed. Back in February, Johnston began his journey the same way he would end it on Nov. 25. by splashing his face with ocean water. He first splashed his face with water on the shores of the Pacific Ocean and then along the Atlantic coast albeit 25 pounds lighter and with a thick, grizzly beard. 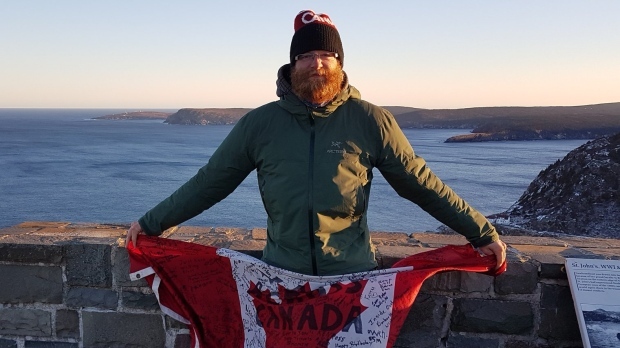 He started walking from Mile 0 on the Trans-Canada Highway in Victoria, B.C., walking along smaller trails and even the TransCanada pipeline at some points. Johnston said he averaged 50 kilometres each day and was constantly struck by the sheer vastness of the country – particularly in the Rocky Mountains. But he was always sure to watch his back, especially as he noticed how many lynxes, moose and even bears crossed his path. His trip was one of the items on a bucket list he’d written when he was 20 years old. Goals included getting a six-pack, backpacking across Europe and finishing school. He wanted to finish the list by the age of 25. “But life happens and things don’t always turn out the way you want them to,” he said. Although Johnston did see Europe, his career as a visual effects contractor “didn’t pan out” in Vancouver. So he returned home to his parents in Saskatchewan. There, he learned more about wilderness camping and then decided to walk across Canada -- two years past his original deadline. He set out with a budget of $7,000 for equipment, food and other necessities. He logged his steps on a Fitbit and made sure to get a GPS tracker so his mother would always know where he was. Weather was a constant worry for him, with the worst experience happening in the Maritimes during hurricane season. Johnston was even forced to wait out Hurricane Willa in a ferry terminal in Channel-Port aux Basques, N.L. He had to stop several times during his trip, including during a blizzard near Lake Louise, Alta. where he hunkered down in a small hotel. “And that’s just the way Canada works, you can’t predict the weather and you got to work around it,” he said. During that month, a stranger vouched for him and he landed a job at a ski resort in Manning Park in B.C. “He didn’t know me at all … but he said, ‘let me see if I can give you a hand,’” Johnston recalled. As he made his way across the Prairies where he grew up, Johnston leaned on family and friends for lodging. But places to rest became more scarce as he moved further east. During the stretch from Winnipeg to Niagara Falls, Johnston was fortunate to always find places to set up his tent and only ended up staying in hostels a handful of times. “I think I had three different people bring me a coffee … I don’t know what it is about Newfoundlanders and coffee,” he chuckled. As for what’s next for Johnston, he’s hoping to travel more and eventually, complete the difficult task of paying off his student loans. “I feel like that’s more impossible than walking across Canada,” he joked. Since coming home to Saskatchewan he’s applied to become a forest firefighter and made sure to mention his Canada-wide walk on his application. “It’s definitely in the resume,” he laughed. Three new official photographs of Prince Louis have been released in advance of his first birthday.